SAN FRANCISCO (AP) — Hall of Famer Juan Marichal mingled in the San Francisco clubhouse and waited patiently for his chance to share a kind, congratulatory word with Madison Bumgarner. Marichal understood it would be tough to find a moment with the man of the night. MadBum, the man of the postseason, more like it. One of the greatest pitchers ever thinks the world of one of baseball’s brightest young arms, so standing in line to speak to the lefty was no big deal. What Bumgarner did to pitch the Giants within one victory of another World Series championship certainly was. The Southern southpaw tossed a four-hit gem in his latest brilliant postseason start, and the Giants beat the Kansas City Royals 5-0 on Sunday night to reach the cusp of a third championship in five years. “It’s what you set your sights for before you go out there, you want to finish the game,” Bumgarner said. The best-of-seven series shifts back to Kansas City and Kauffman Stadium for Game 6 on Tuesday night, and the Royals will try to stave off elimination with the blue-clad crowd behind them. If the Royals can push it to a Game 7, they might just see Bumgarner come out of the bullpen. Once Bumgarner’s initial postgame duties on the field were complete, he removed his black cap and tipped it in several directions to the sellout crowd, then offered a wave to the frenzied faithful in orange chanting their would-be World Series MVP. “Clayton who? MadBum!” one man yelled as he exited AT&T Park in reference to Clayton Kershaw of the rival Dodgers. It’s true. Bumgarner is the one who has proven himself on the October stage, now drawing comparisons to some of the best pitchers ever this time of year — October aces Bob Gibson, Sandy Koufax, Curt Schilling. “Very humbling,” said Bumgarner, who improved to a remarkable 4-0 in four World Series starts with an 0.29 ERA. The fans are sure letting it be known MadBum is the “M-V-P! M-V-P!” and Bumgarner seems the logical choice if the Giants can win one more in Missouri. 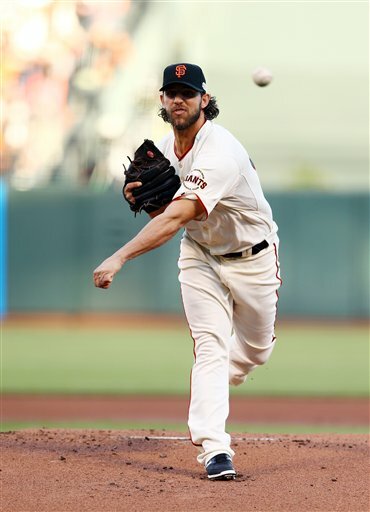 He outdid his own dazzling performance from Game 1 last week with a sensational start Sunday at AT&T Park, where he hasn’t always been his best while pitching better on the road. “It’s Oct. 26 and he’s as strong as he was in May,” catcher Buster Posey said. And this October: 12 hits over 31 innings with 27 strikeouts. One thing he doesn’t want to hear are questions about fatigue or a tired arm, or even his high innings count at this stage. The durable, 6-foot-5, 235-pound pitcher from Hickory, North Carolina, swears he can handle it all physically. San Francisco’s relievers were thrilled they got to watch it and not warm up the way Bumgarner was dealing. Bumgarner struck out eight and didn’t walk a single batter. No Royals baserunners reached third base. Bumgarner pitched the first World Series since Josh Beckett did so for the Marlins in the 2003 Game 6 finale at Yankee Stadium. It was the lefty’s second this month. Bumgarner got the wild-card Giants’ special run going with a 109-pitch, 10-strikeout four-hitter in an 8-0 win at Pittsburgh in the one-game playoff Oct. 1. Bumgarner, with that cross-body delivery everybody describes as making it so difficult to track the ball, effectively changed speeds to keep Kansas City’s hitters guessing and off balance all night. So were the players behind Bumgarner. Shortstop Brandon Crawford drove in three runs and took part in a great display of defense by the infield, while third baseman Pablo Sandoval said he wanted to do everything with his glove to keep Bumgarner’s big night going. The Giants are suddenly clicking at the plate. After falling behind 4-1 on Saturday night in Game 4, they have scored 15 straight runs. Bumgarner hardly needed all those San Francisco’s hitters gave him. In April 2012, the Giants rewarded Bumgarner with a $35.56 million, six-year contract through the 2017 season — locking up the lefty through arbitration and his first year of free agency. What a move. He won a career-best 18 games this season and has kept it up through a deep October run. The 77-year-old Marichal, for one, can’t wait to see more from MadBum. He’s only 25, after all. But this performance was beyond what Marichal could have guessed. Even manager Bruce Bochy was still soaking in what he had just witnessed.